You’ve conquered all of the beginner trail runs across the front range. Now it is time to raise the stakes a bit and try out some more technical terrain. 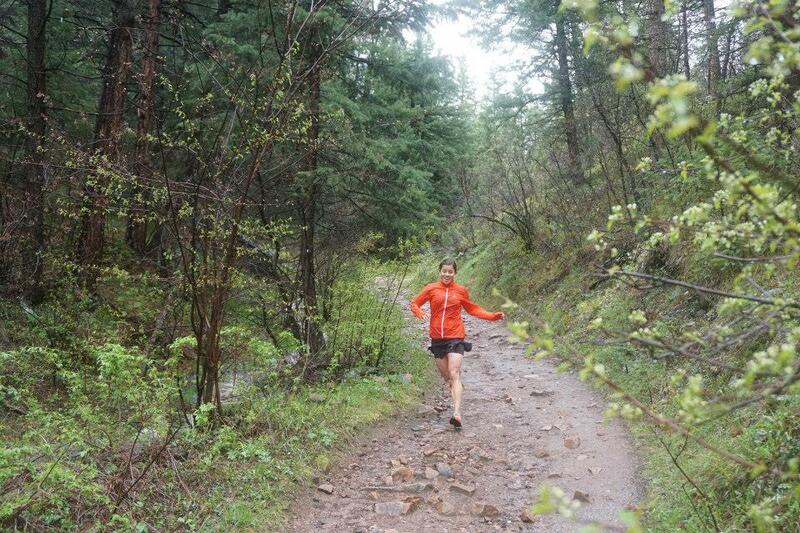 In this post, we will highlight our 5 favorite trails appropriate for intermediate trail runners. These runs were chosen because of their proximity to the greater Denver metro area (all within 20-40 minutes). There are many more amazing trails to explore further west (Conifer, Genesee, Idaho springs) north (Boulder, Longmont, Fort Collins) and South (Monument, CO springs) which we hope to cover in future posts. Please share your favorites in the comment section below! This park is probably the most accessible for Denverites as it is just a quick hop off the 1-70/c-470 junction (Morrison exit near the Dinosaur lots). These trails wind through open fields and up and over the top of a small plateau. You will encounter some rough and rocky sections on this popular trail and but also expect plenty of sun exposure, there is no tree coverage on this trail so be prepared with your hat, sunglasses and plenty of cold water if you plan on running this trail on a hot day. 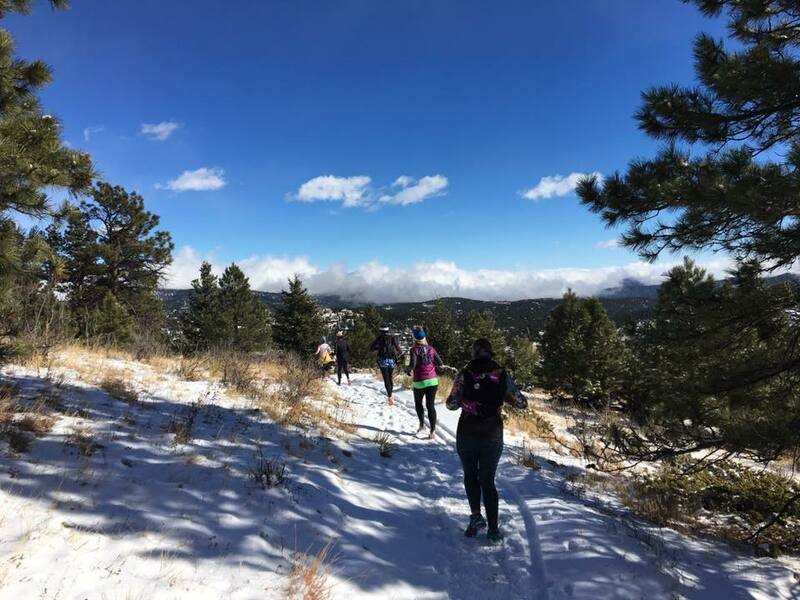 Do the Red Rocks/Morrison slide loop for a shorter run or for a more adventurous option, cross highway 93 and take the Dakota ridge trail along the top of the hogsback. 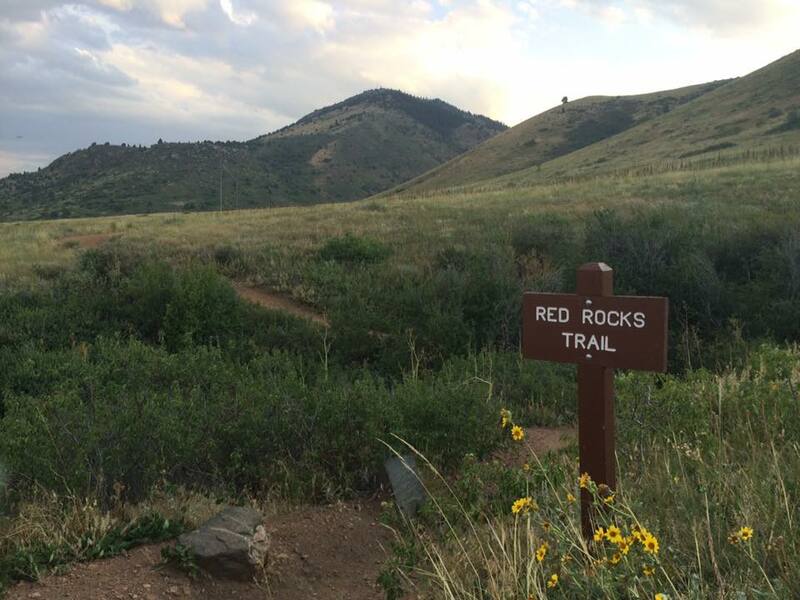 For added mileage, link up with sister trail systems nearby (Red Rocks park and Hayden/Green Mountain Park). See our post on multi-trail adventures for specific ways to create an extended run from this park. 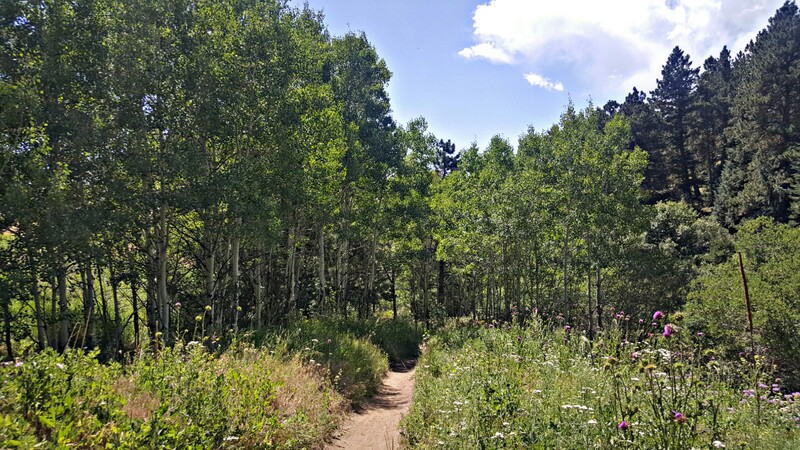 Tucked away behind Heritage Square (Colorado natives will remember sliding down the alpine slide along the profile of the foothills here), this beautiful park boasts a variety of terrain in its almost 10 miles of trail. Start your run on the Apex trail and enjoy a cool reprieve from the hot summer sun along a small creek. Continue onto the Enchanted Forest trail and like it’s name suggests, the tall old pines and rock formations through this section give you the sense that you’ve just stepped into a fairy-tale world. You will barely notice that you’ve been climbing for over 2 miles at this point. Complete the loop by taking Hardscrabble/slicebox to the top and around Indian Mountain for a view of the city and then enjoy a fast descent down the Pick-n-sledge/Argos trails. This park contains 16.5 miles of trails through open meadows and lush forest. The trails are never too steep or technical but don’t be misled, if you take the trip to the top of Bergen Peak you will gain over 2000 feet! There are options to create multiple option loops for the beginner to longer more strenuous lengths for those seeking a challenge and a view. According to the Jeffco open space website, “Elk Meadow Park is the most likely place in the Open Space system to view herds of elk” and other native wildlife. Enjoy over 13 miles of trail in this beautiful park with the perfect combination of quad burning climbs, technical descents and epic views. This park is a favorite to escape the summer heat. After the first 1/2 mile, the Plymouth creek trail is mostly wooded and follows a small stream where you can find small snow patches even into early summer. 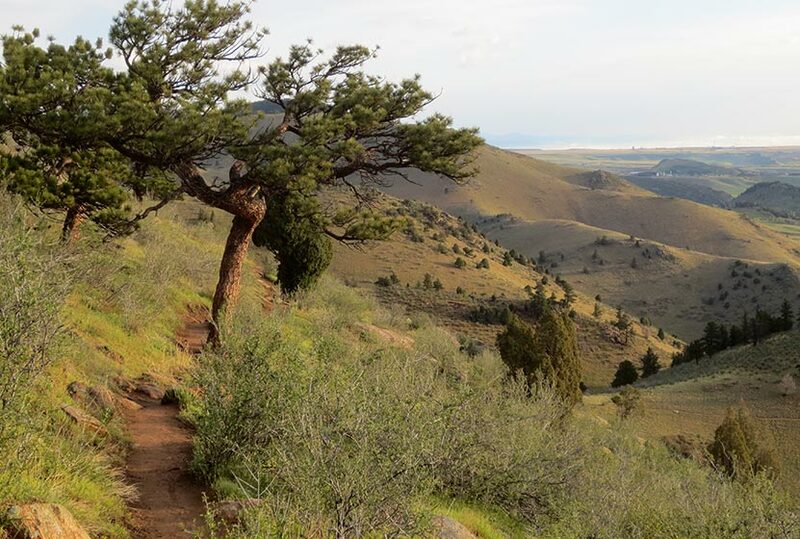 If you are seeking a short but exhilarating run, take the Meadowlark hikers only trail which switchbacks up the mountain, cross the bridge and head back down the Plymouth Creek trail for a 2.6 mile loop. 21992 Golden Gate Canyon Rd. This pick contains some of the most technical terrain but arguably the most rewarding views. From the parking lot you start right up the mountain (no time for a warm-up) in a tough, exposed climb that takes you to the Mt. Galbraith Loop which circles the top of the 7,260-foot peak. Enjoy a scenic view of the snow capped peak of Mount Evans and miles of the surrounding mountain range. If you take the loop clock-wise, you will enjoy an adventurous descent through thick forest with some scrambling around rock formations that cross the trail. Although there is only 5 miles of trail available at this park, it is worth the drive to explore. And there is always the option to do multiple loops if you are thirsting for more miles! Are you new to trail running and seeking to discover new trails and the camaraderie of running in a group? 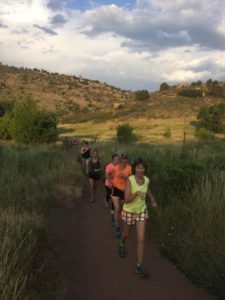 Check out the Life’s 2 Short women’s training group! We meet 2-3 times a week at different trails across the front rage for coached runs, fun, new friends and support! ← Grip strength workout for Obstacle course race training!